iPhone developer Ryan Petrich has done it again. 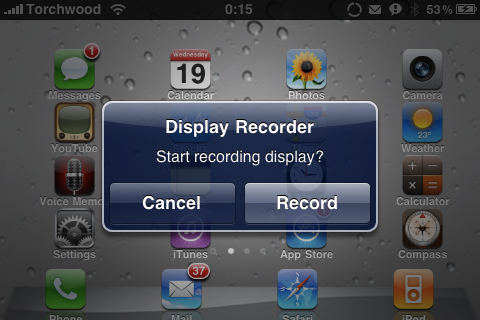 He has just released a new app in Cydia, called Display Recorder. In case you didn’t figure it out from the name, Display Recorder can record a high quality .AVI video of everything on your iPhone display. You can adjust for portrait or landscape. You can set the video quality to low, medium, or high, and set the frame rate up to 24 fps. There is in-app support for uploading to YouTube, but because the the videos are in .AVI, you are not able to watch the video back, on your iPhone. Probably the coolest feature is, Activator support. With this, you can quickly start a new video from within any app, with a quick swipe or tap. You can manage your videos, via a web browser, over a WiFi network, by turning on the Web Server option. In Safari, just open a new Bonjour tab, and you should see your device on the list. Double click it, and you can view all the videos you have recorded, see a live view of your iPhone’s screen, or take a screen shot. As you can see, the video quality is pretty good. Much better then the former solution, I used: ScreenSplitr, streaming to DemoGod, over WiFi. The frame rate was terrible using that method. The resulting video was so choppy, it was barely viewable. 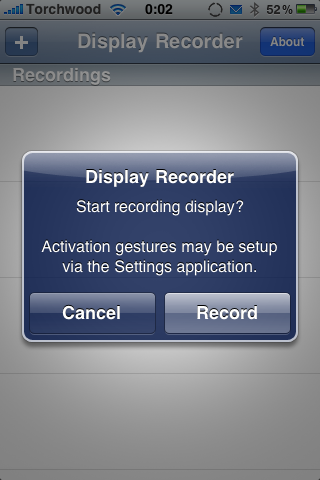 Display Recorder records awesome video, but does not record the audio of any apps that are running. Another draw back, is that there is no support for the iPad. Maybe in a future update? This is the perfect app for bloggers, or any one who does reviews of apps and games for the iPhone. It is available in the Cydia Store now, for $4.99. Awesome – can you stream the video out through USB or some other? I’d love to stream it into another computer app I’m using. Is this possible? Yeah sounds awesom..How the hell do you get it?? so if i talk my voice wont be recorder? do you need wifi for this?? 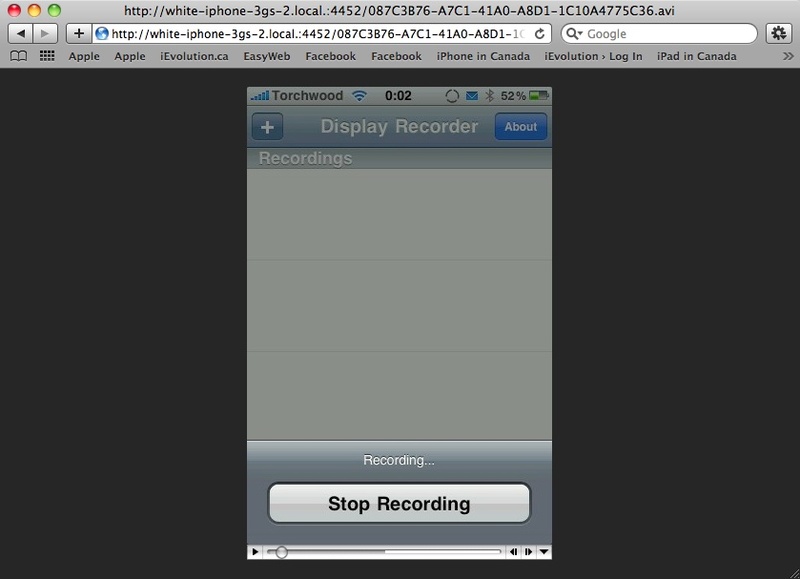 You need jailbreak your iOS device to run Display Recorder, that’s not cool. 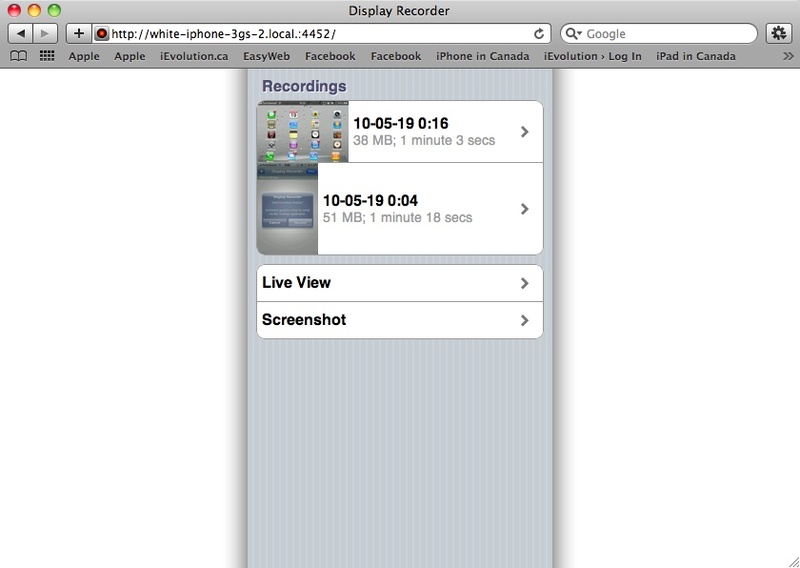 Why not use a desktop app like acethinker iphone screen recorder, no need jailbreak. I use it to make screen recordings of my apps. It uses AirPlay and has a built in recorder that captures picture and sound.